Below is the demonstration painting that I did for Sandpiper Studio last weekend. This event was organised by owner Julie McLean who also teaches painting. 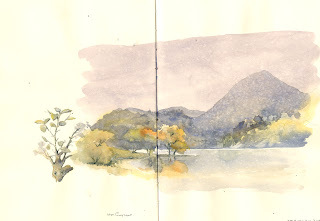 The subject of the demonstration was water and reflections so I chose this view of Llyn Gwynant which I had sketched on a damp day. (Above) You can see the speckles where the rain has fallen on the sketch whilst the wash was still wet. I quite like painting watercolour sketches in the rain. It keeps the washes fluid and prevents you fussing about with the detail. I emphasised to the audience the importance of sketching to capture mood and atmosphere. Something that is difficult to capture in a photograph. The painting was done with Unison Pastels on Fisher 400 Art paper, which is an abrasive surface and extremely good for creating mood and atmosphere and for portraying reflections. The distant mountain was kept cooler in colour, lighter in tone and without any detail. These three tips will help with the illusion of recession. The autumn colours on the foreground trees also help with this illusion, as their bright, warm colours and stronger tones stand out well against the soft blue grey background. If you are anywhere near Llandrindod Wells this week please come along to Art in the Park on Wednesday 22nd August where I will be demonstrating in pastel and on Thursday 23rd August where David will be demonstrating in watercolour. You can even join in and do your own painting of the Rock Park for the exhibition at the weekend. 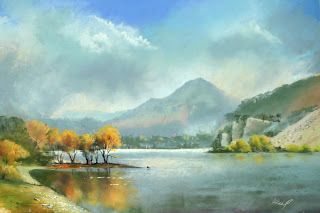 This entry was posted in art, atmosphere, composition, demonstration, Jenny Keal Blog, jenny keal pastel., pastel demonstration, pastel painting by Jenny Keal. Bookmark the permalink. For a ‘demonstration’ painting this is delightful. I really like the autumnal gold reflections of the trees. As usual your sky work is gorgeous!